This is another one of the sketches I did back in the late 1980's when Kevin and I were trying to come up with concepts to help Playmates flesh out the rapidly-expanding TMNT toy line. Can't lie I wish you guys still did this today. 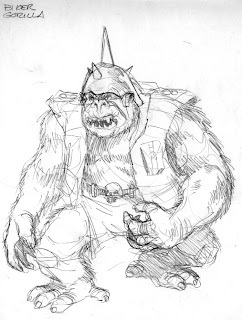 -->> Vaughn mentioned to me that he looks like Lavigne's Guerrilla Gorilla ( a k a Sgt.Bananas ) !! Has Playmates express a desire to produce more mutant characters for the recent and possibly future toy lines?